But the good news is, with a little elbow grease and some creativity, I made my own bouquets for about a third of the price, AND I got to sit on the beach without feeling guilt for the money I was throwing down the drain for flowers! Winning! And do you know how much that all cost me (including supplies and ribbon)? A whopping $345.64! And guess what, they were just as beautiful as the bouquets I had picked out in the magazine...I couldn't have been happier! I first spent days looking online to get an idea of what type of flowers I wanted. I knew I wanted to include hydrangeas in my bouquet because not only are they beautiful, but they are very full...so a little goes a long way in making a bouquet look bigger with less flowers to purchase. I love roses, so I knew I wanted to include a few of those as well. And I knew I wanted my bouquets to be round and a pop of green (to match my shoes and my color scheme of gray with dark purple & green accents). Green Hypericum Berries (100 Stems) Note: I loved the added depth these surprisingly gave the bouquets! The total for all of the flowers came to about $326 (and BONUS: Sam's Club had FREE shipping!). Then I spent about $20 on green floral tape, burlap and ribbons. I would recommend ordering the flowers so that they arrive by Thursday for a Saturday wedding. That gives you a day to receive them, clip and put them in fresh water (as soon as they arrive...this is important) and still be able to make them Friday morning while having the rest of your day to enjoy the rehearsal, rehearsal dinner & wedding without having to feel rushed! This also gave us a buffer for shipping error...which happened to be a great thing, because my roses were delayed a day due to a hurricane! Yikes! An extra pair of hands to help hold the bouquets while you wrap is super helpful. Once your'e done with that, place the bouquet in water and set aside. Note: It was easier to do this process for all the bouquets first, then add the burlap and ribbon together as the last step, because the floral tape will leave your hands sticky! I basically did the same procedure as the bridesmaids bouquets, I just made mine slightly larger, and used only the white roses (instead of green ones) to make it look a little different. I used green ribbon with my bouquet to match my green shoes, and on the bridesmaids bouquet I used dark purple ribbon to match their shoes. The mother's & grandmother's mini-bouquets were basically smaller versions of the bridesmaids bouquets with 3 roses, 2-3 mini-hydrangea stems and 2-3 hypericum berries...sadly I couldn't find a picture of those - sorry! Once you've got all of your bouquets assembled, it's time for the burlap and ribbon. We cut a piece of burlap just slightly larger than the width of the floral tape around the stems, and left room to fold down the top and bottom sides (so that the edges were smooth and not jagged). Fold down the top and bottom edges of the burlap, wrap around the base of the bouquet and secure with one line of hot glue (be careful not to burn yourself!) you'll need an extra pair of hands for this process as well to get it tight and secure. After the glue dries, tie the ribbon of your choice around the center, where the tie will face outward. I chose to tie mine in a knot, you can do a bow as well...it's totally whatever look you prefer! For an extra touch of glam, as well as my something old and borrowed, I added a beautiful brooch from one of my grandmothers, and underneath it, I tied my other grandmother's original wedding band. 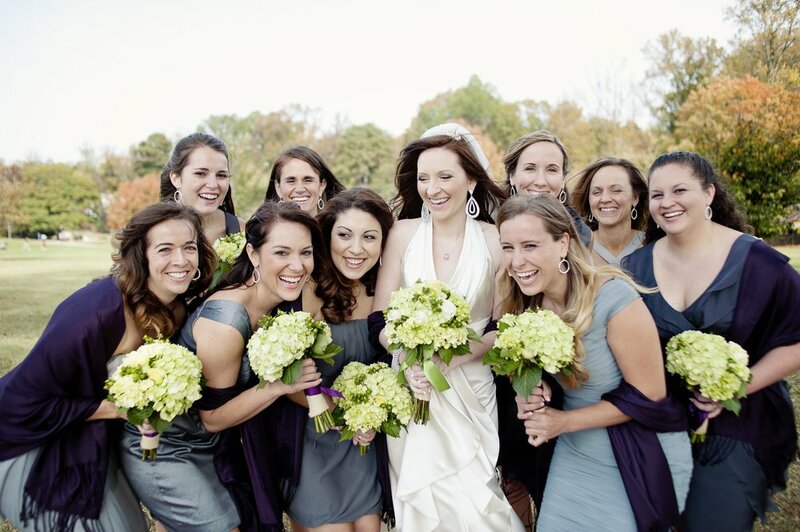 They looked beautiful and made my bouquet extra special...I felt like I was carrying them down the aisle with me! 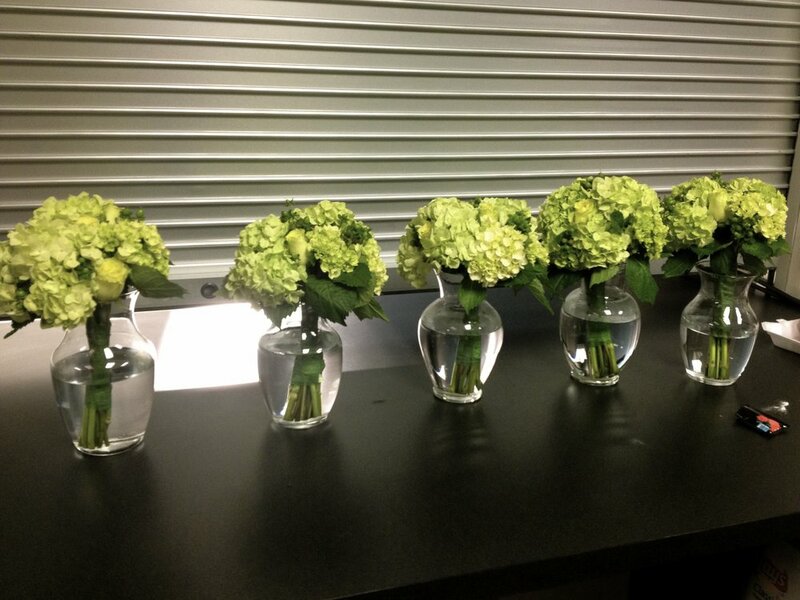 Once you're done with your bouquets, be sure to store them in a vase with water and also in a cool place - hydrangeas are absolutely beautiful, but they do wilt easy...keep them cool!! And that's it, beautiful bouquets for about a third of the price... I couldn't have been happier with the way they turned out and the money we saved! Hope this helps for any brides who are toying with the idea of doing your own bouquets...please feel free to comment below with any questions! Happy arranging! Disclaimer: Post contains some affiliate links.